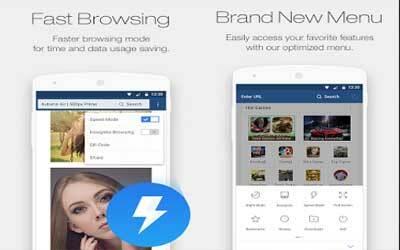 Its users recommend UC Browser Mini APK 10.7.8 as the best browser application. You can install it for free under the communication category in Google Play Store. This browser application does not require in-app purchases. All you need to do is to download and install it in your smartphone, and you are ready to go. It has the best feature that you cannot find in other browser application. It is able to download any contents from website into your smartphone storages faster. This feature makes many users prefer it than the other browser in their gadget. In this review, we are going to discuss the reason why this browser is special. When you run a browser in your smartphone, the first thing you will notice is the interface. UC Browser Mini has brand new menu design. This design allows you to access your favorite website easily. Additionally, you can also customize the contents on the menu page. Besides able to surf faster compared to other browser, it is also conserve your data usage. Loading a website page with lots of data usage can be done in seconds. As mentioned before, the best feature you can get by using this browser is the speed download feature. This application helps to save your time by download files faster. After you download files from the website, the files are directly sent to your smartphone storage. If the file you download is a video file, you can play it as soon as the download is complete. The video player is a built-in feature of this browser. The other feature that you can found in this fast browser application is quick search bar. It allows you to search any website from the notification bar on your smartphone. To read any websites comfortably at night, you can switch to night mode. Incognito browsing is also available in UC Browser Mini for Android to secure your browsing information. Fixed the problem with unencrypted URL being sent when visiting HTTPS pages.